Dominos $25 Pizza Gift Card - E-mail Delivery Just $20! You are here: Home / Great Deals / Amazon Deals / Dominos $25 Pizza Gift Card – E-mail Delivery Just $20! Dominos $25 Pizza Gift Card – E-mail Delivery Just $20! 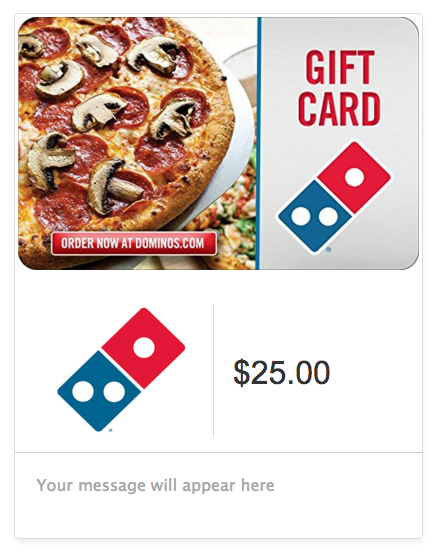 Head over to Amazon to get a Dominos $25 Pizza Gift Card – E-mail Delivery for Just $20! Just enter promo code DOMINOS5 at checkout to get your $5 off!